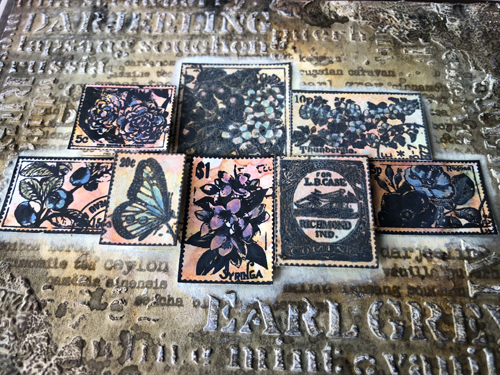 Raquel is back, and boy has she worked her socks off to create these amazing stamps and stencils. Each hand drawn to perfection, we both laboured over working, and reworking the designs until we felt they offered all kinds of creative options. 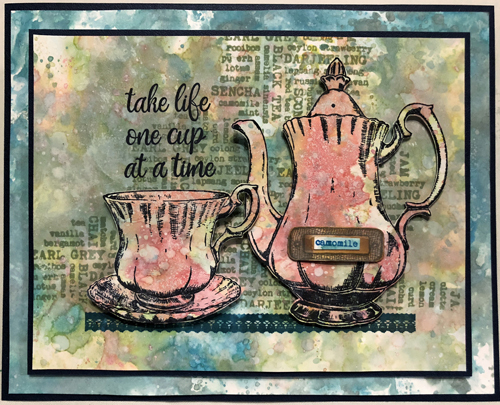 Raquel does like a Vintage inspired theme, and this one is 'Tea Time'. Grab a cup of tea, relax, and let us usher you through a wealth of ideas from Raquel. First up she does love to share techniques with you, and Raquel has prepared 2 videos! (You may want to read the rest of the post, then come back to see these.) 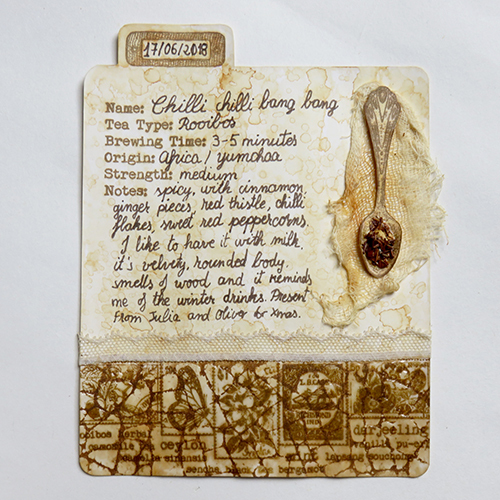 The first one one involves a large new collage stamp she drew, Violetta infusions and Grunge Paste the sample above. 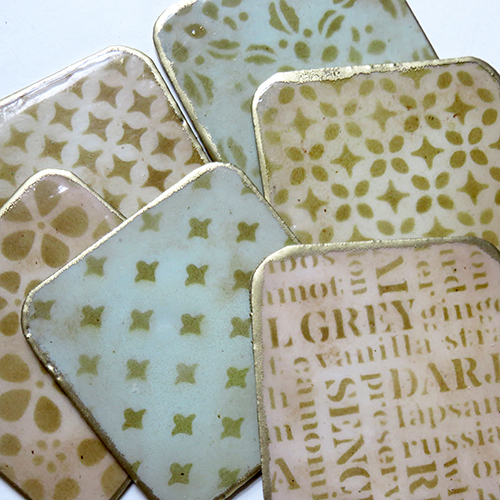 And below is the same sample with a bit of additional stamping and layering to finish. 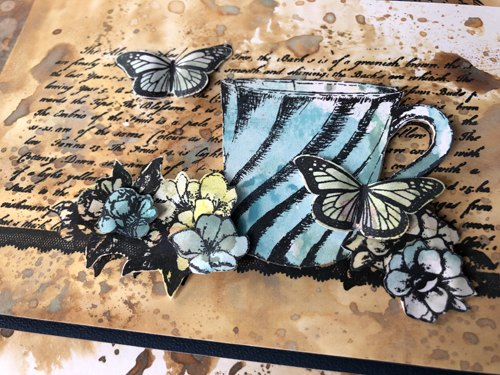 In the second video, you will see Raquel create a journalling page layout, using paints, infusions, in a beautiful soft manner, with a great rust technique too!! She comes up with so many interesting ideas! Enjoy! 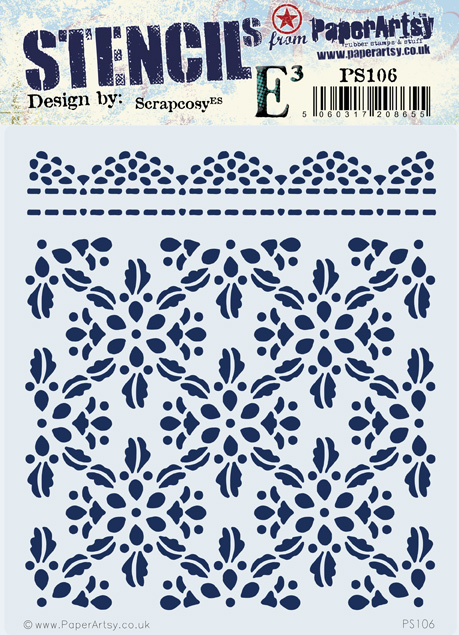 Hi everyone, Raquel here from scrapcosy. 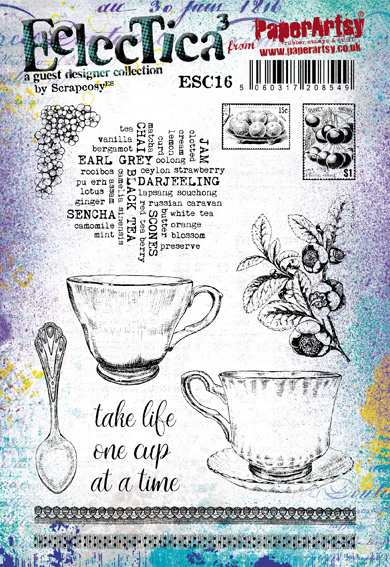 Today it's a very special day for me because I feel I'm sharing with you the collection of stamps that has always been in my mind to create: 100% tea related! ESC03 and PS051 were already a hint (tea import / map related). 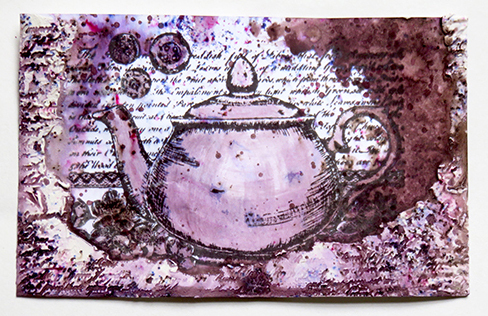 You can tell tea has a place in my heart when you read my blog header ends like “… all accompanied by a cup of tea”. 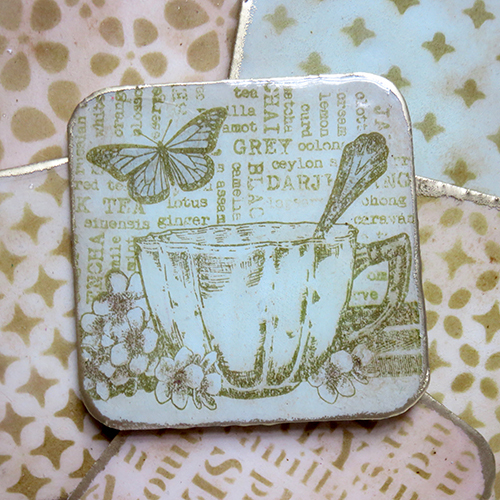 I can’t picture a better crafting time than spending it with stamps, inks, tools, inspiration and a cup of tea. I can say I collect stamps but I think I can also say I collect tea-related things. 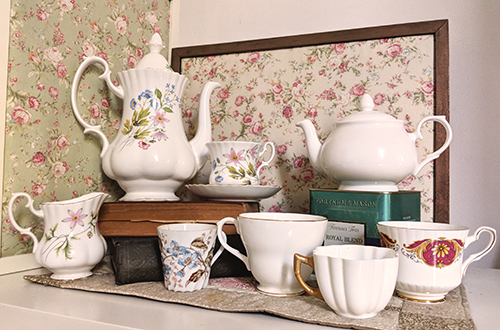 I don’t have more vintage teacups and teapots because we don’t have enough space at home, so now I only allow myself to collect teas. 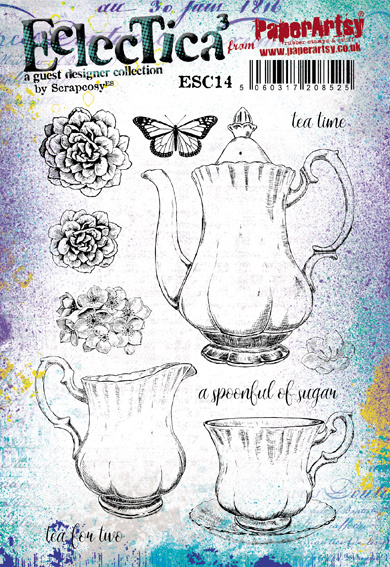 I may have 75+ varieties of tea and, as it happens with crafting tools and inks, although you have many, you end up most of the time using the top favourites. 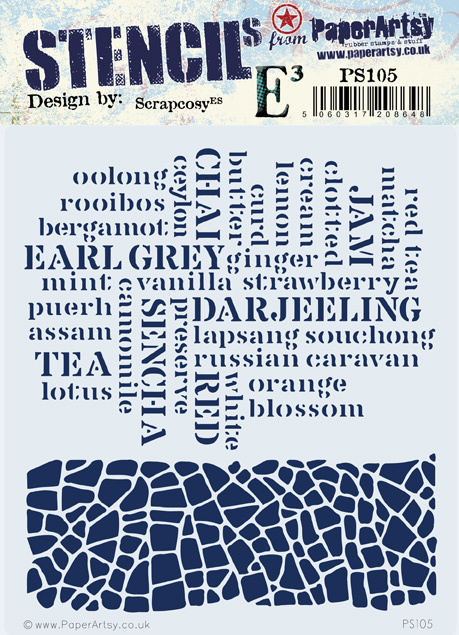 In the crafting world, I always end up with Infusions or distress inks and in the tea world, I end up with a variety of earl grey among my top favourite 3 teas. So now let's see all the products and few samples I've created with them! 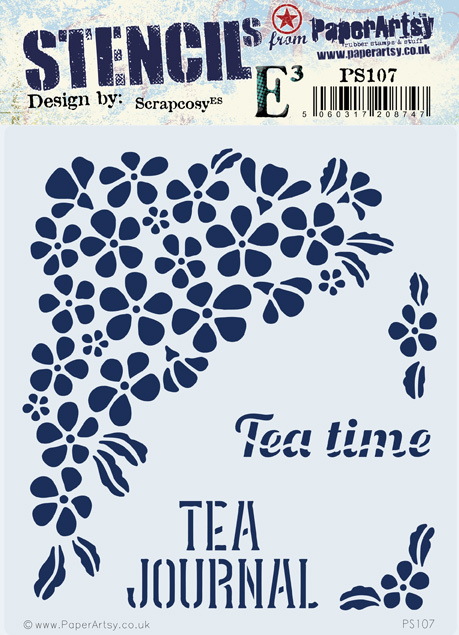 With this stamp set, you have already seen the teapot sample in the video. 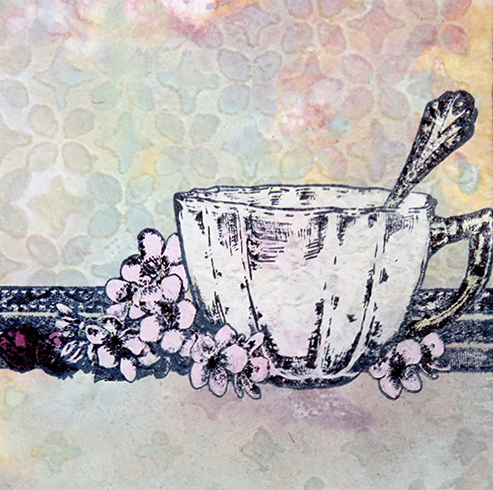 Above is another with oxide inks, stamped and layered. It's nice how the various collage elements can be made 3 dimensional. 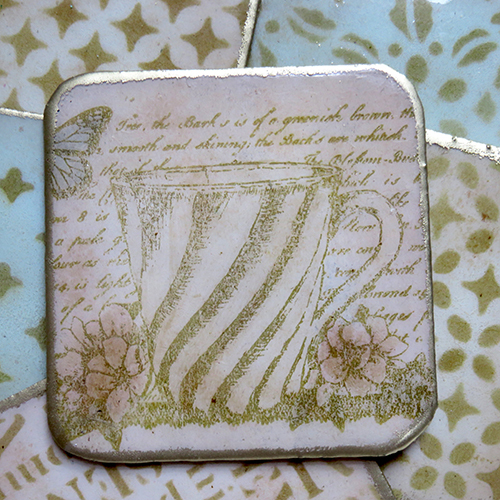 I also used the tea mug collage to create one of the six coasters (more pictures at the end of the post). I really had fun just colouring the images. 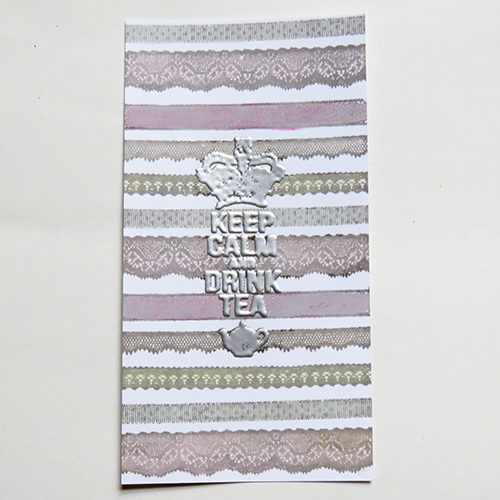 Keep an eye out for the lace of the stamp set which I haven't used yet. I'll show you later what I did with it. 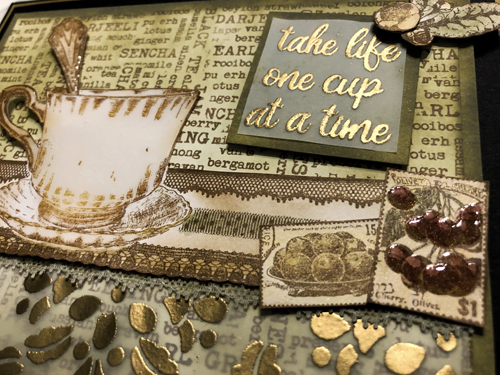 Here I created a scene with the different elements of the tea set, although I also added some elements of other sets you'll see below. 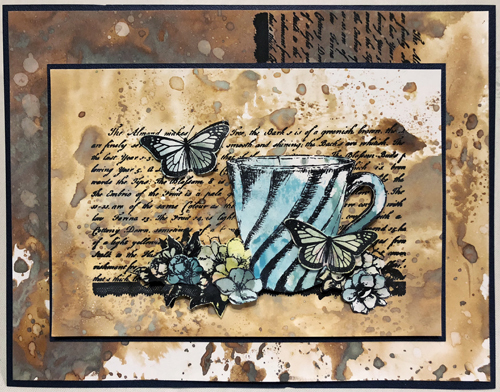 I wanted a soft finish so I went for infusions with water, to watercolour my images that were stamped using Versafine Smokey Gray. This type of ink is perfect for such detailed images. These stamps are VERY detailed. 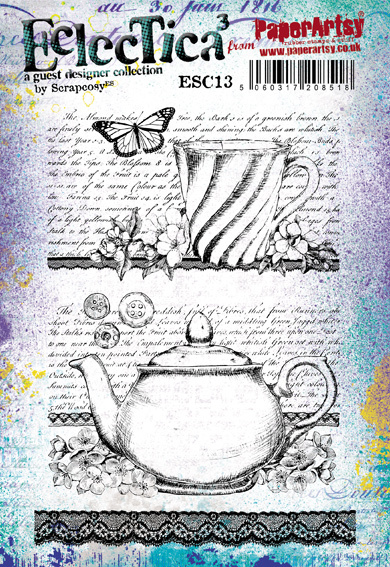 Because we tend to think of fine bone China as white, it makes sense to stamp a teapot in grey ink. Shading in grey also can add shadows quite easily, like my original china. The next sample is with 2 different oxide ink backgrounds. The lower level piece of card is over-stamped by the 'teas' script. 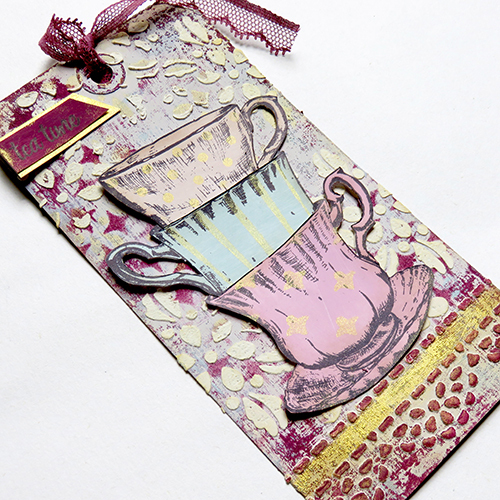 The contrast of pink on green in pretty, but the grunge of the oxides still is cute with the Vintage Tea Part vibe. A simple construction but effective. 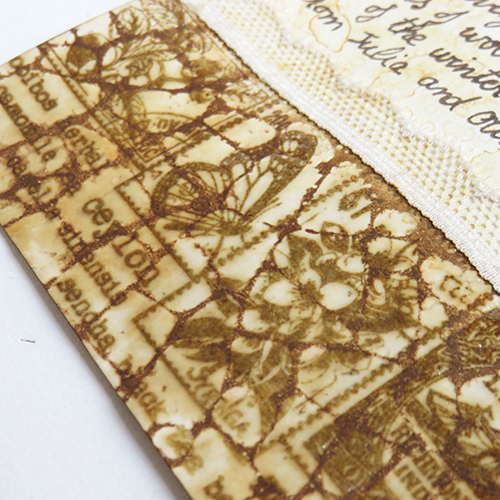 ...but it also nice to stamp as many as you need and create your own ephemera. Never run out of postage stamps again! 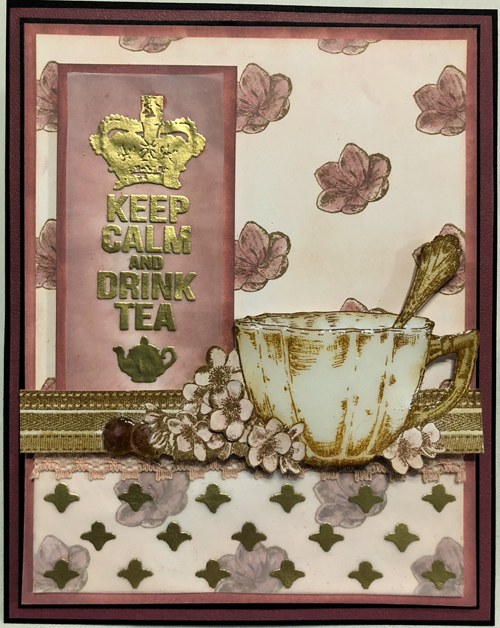 I used here the cup-collage and added some volume by stamping again, cutting some of the flowers and sticking them back in place (paper piercing). I also added more volume and shine with glossy accents on some parts of the collage. It makes sense to do that one a white china teacup right?! 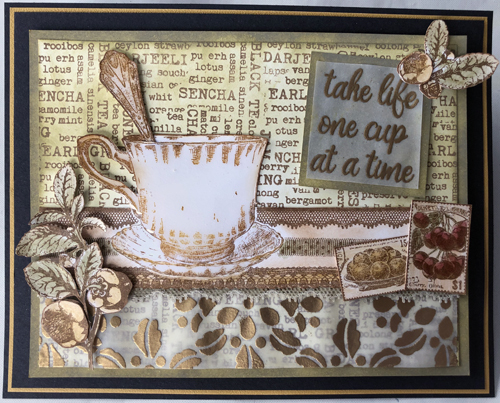 On some stamp sets I created collages for you, but with this one I give you individual images and elements so you can create your own collage as I did here with the laces, the cup and the spoon. 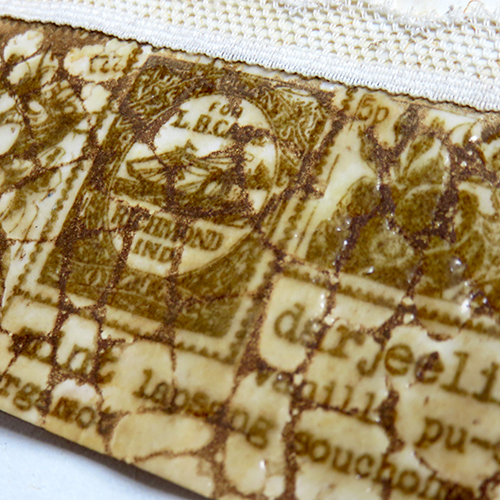 I really enjoy adding a crackle touch to some projects but sometimes crackle textures or crackle mediums take time to dry and to actually crackle. 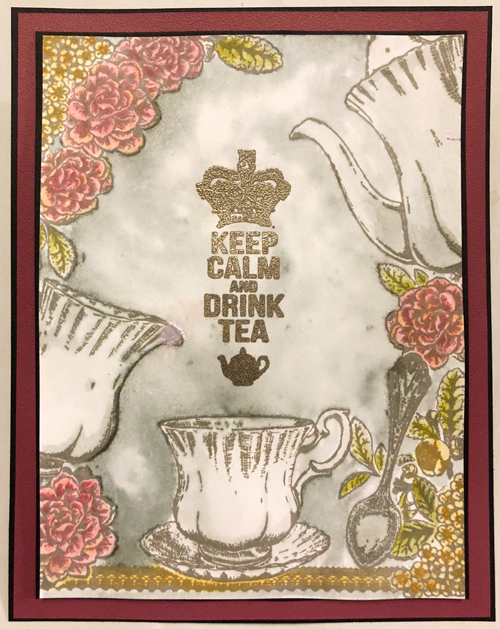 With this stencil, you just need to apply grunge paste and heat set for a white crackle, or even better, if you want it as in above, you just need to apply versamark ink through the stencil and some clear embossing powder (I used UTE) and you will get a resist once all is heat set. Then colour the cracks that are not protected with a dark ink or paint and voila! 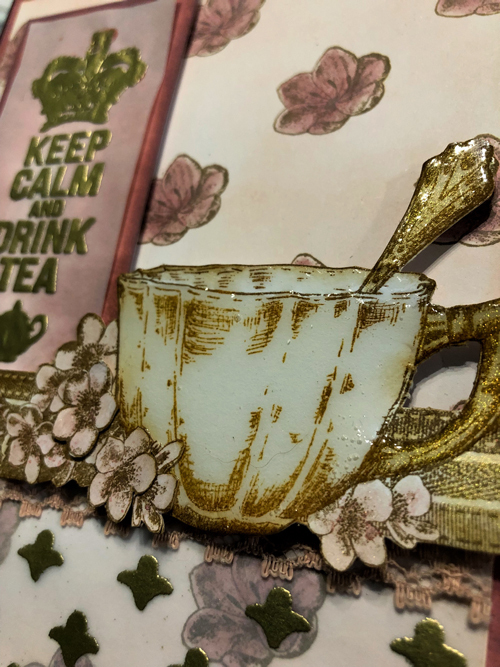 Here I applied Grunge Paste through the stencil on the tea word-cloud and I rubbed on some Delicata Brown ink (it's a pity you can't see the shine of the brown metallic from this angle) and a touch of dry brushed paint on top for yet more contrast. These words re going to be super-useful with texture! 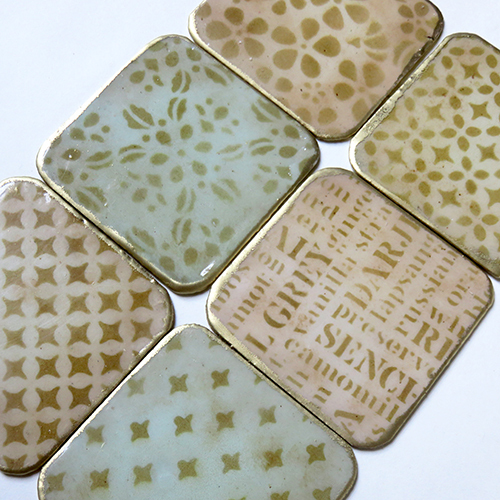 I love creating stencils that you can repeat over and over by repositioning them. And this one has a baroque like touch that reminds me of a vintage wallpaper. 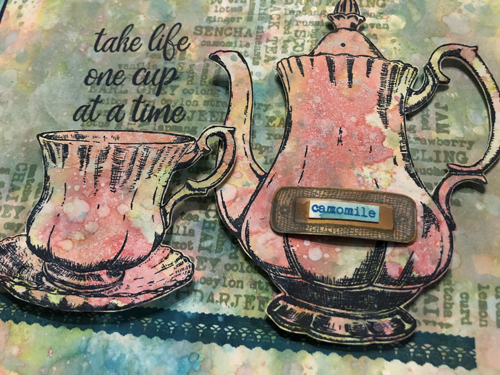 In this sample I used the stencil with Grunge Paste to create the background of the tag and to add that lace at the bottom. 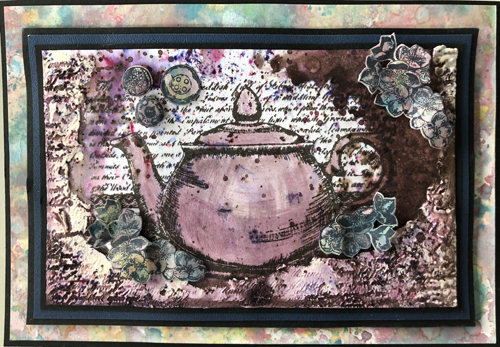 I used as well the new Fresco paints by Courtney Franich (Mulled wine, Blah Mange, Seaglass and Vintage lace) to create that monoprinting base and to paint my cups and the lace. You can see a sneak peek of PS108 as well on the top left background. 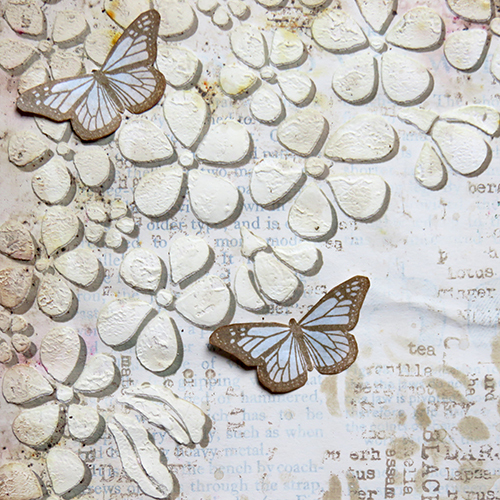 Here I used the bump technique with the big floral stencil to decorate a corner of my art journal page. 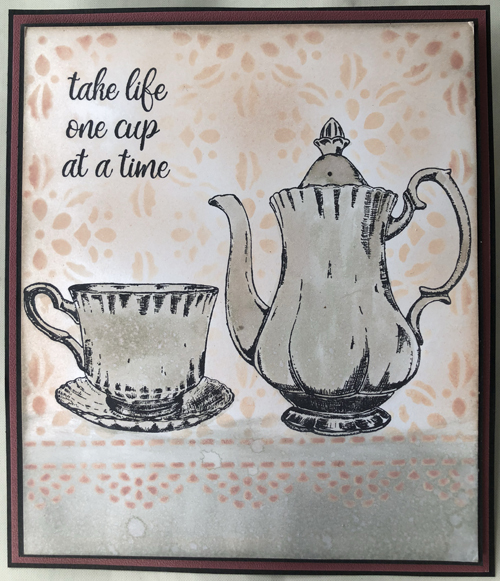 This stencil again can be repeated over and over to create bigger backgrounds, as I did in 3 of these 6 coasters I created. These are the reverse sides, all stencilled using ink on top of a background that was previously painted with the new Fresco Paints by Courtney Franich (I used Seaglass, Vintage Lace and Eggshell) and I coated all with UTEE and with a sprinkle of Vintage Beeswax Baked Texture Powders by Seth Apter / Emerald's creek. 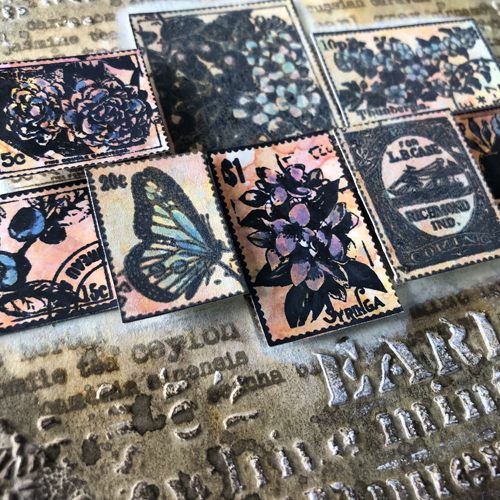 And finally, of course, the stencil also looks amazing with paper and oxide inks and plenty of water, this effect is so pretty too! Now I'll show you other samples that I would like to share with you as well. I hope you like them! And I stencilled the backs as you've seen before. I really like these, so simple but so striking. 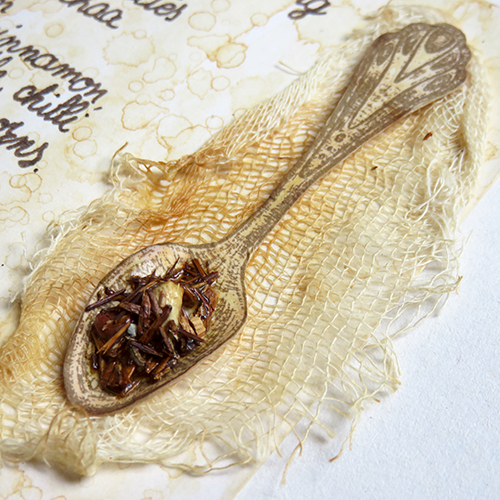 I also added the tea itself (dry) in the spoon and attached it with glue (I used Mod Podge but any gel medium will work as well). I loved that after cutting the spoon, you can bend it and shape it, so it seems really 3 Dimensional ! And as you've seen before, I added some crackle with PS105 and some UTEE. I love the effect. 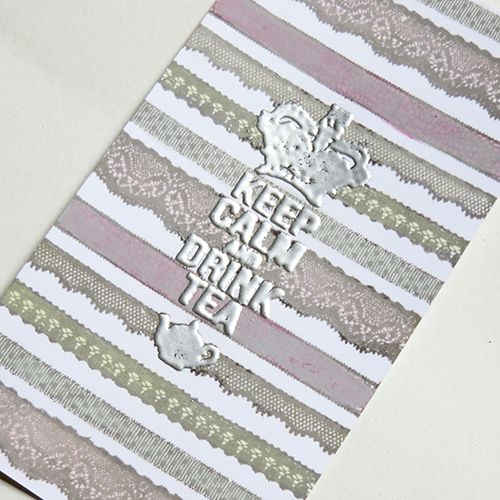 I decided to create a sample with all the laces from all the sets and stamp the Keep Calm quote in the middle, which I double embossed in silver. I used the new paints by Courtney mixed with satin glaze to add colour on the laces, but for some of the laces I added too much paint and too little glaze, so they became too opaque. Still the effect is soft and subtle. What do you think? Do you like it? Its an easy background! 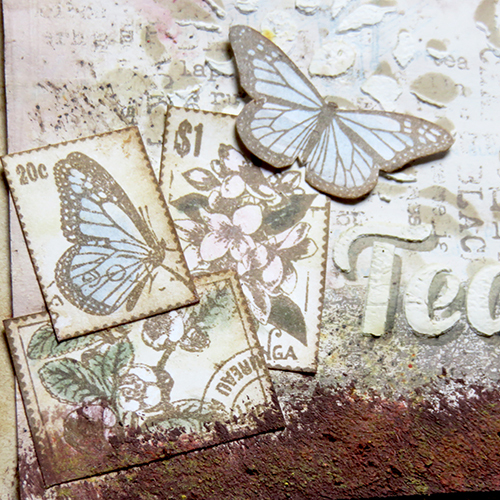 I enjoyed a lot playing with my new stamps. I know I'm not supposed to pick a favourite, but this release has made it to my top! I can see I will use it A LOT! You don't know how many other things I've done already. And I couldn't share them yet because it was a secret! Aaargh! But today, doors are open and these babies can finally see the world! Sharing time!! PS Don't forget to go back and look at the Videos at the top of the post! Oh Raquel....totally fabulous collection. Congratulations. I'm now off to watch the videos! Wooohooooo we did it!!! WHat an epic ride that was to get to this point, but oh so worth it, these stamps are going to be in use for YEARS!! Love them! Thanks so much Autumn! I'm happy you're not disappointed I didn't create the forest creatures (just yet:🤭) thanks for your feedback!! I'll respond more comments later, when I land in Stockholm! Yay!! Yay!! So happy!! Thanks again for everything!! Oh! Racquel - no wonder things have been quiet on the Scrapcosy front! WELCOME TO GREAT BRITAIN - well ENGLAND really - and one of the best things to come out of the country! But WALES and Scotland are equally famous for their 'High Teas' - best taken round a log fire in the autumn / winter - toasting crumpets - and chestnuts - on the open fire! Somewhere between 4pm and 5pm normally! What a fabulous collection for all of us afternoon-tea fans, but you've not forgotten the Coffee drinkers / 'Elevenses' either! 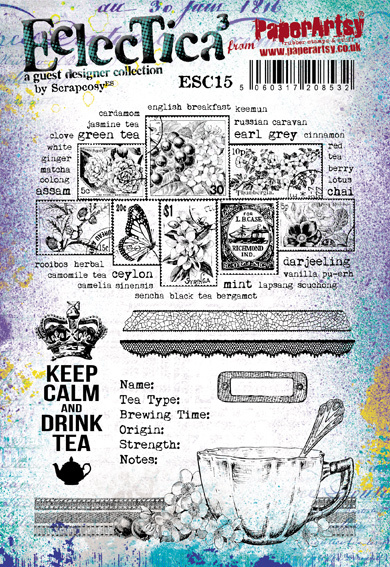 I love the 'Postage Stamps' / tea labels/stickers stamp-set. You've really thought outside the box with this collection - well done! I'm going to have to run a retreat now - just so you can take a class on it! Thanks Jennie! I'm very happy you like them so much!! I love the stamps and the stencils, too. Beautiful! Lovely new stamps! The samples look fabulous too! Wow! This is a really beautiful new collection Raquel! I can see why it is your favourite. Some wonderful techniques too! Seriously stunning new release Raquel, what a lot of work it must have been to put this all together. 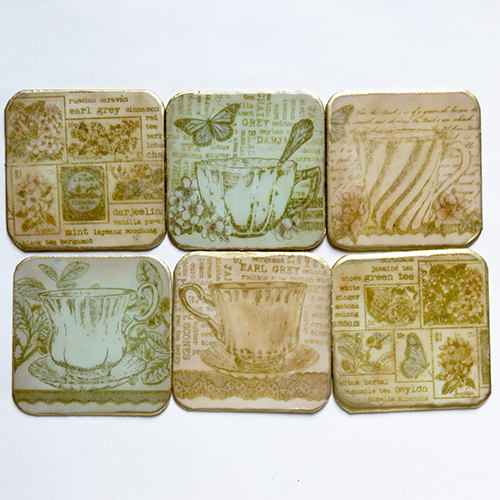 I love tea, stamps, plants and repeat design stencils so these tick all the boxes for me. I watched the videos this morning, your samples are fabulous. 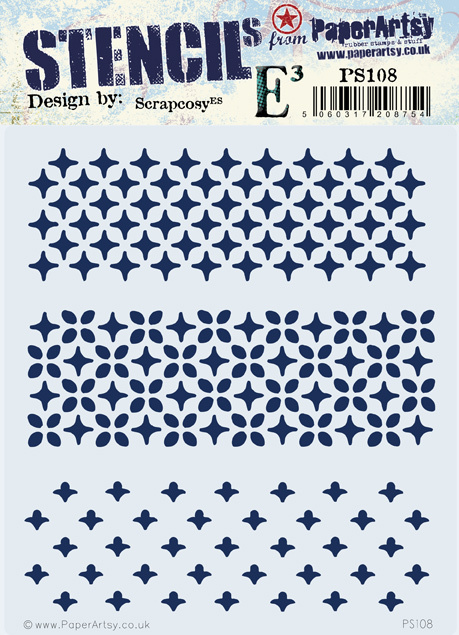 Gorgeous stamps, Raquel, I have already got one set and a stencil and am planning what to make. Huge congratulations!